William Workman was the eldest son of William and Grace Workman. He was born on 12th April 1897 in Ballygawley, Aghadowey. His mother died when William was just three years old. His father remarried. 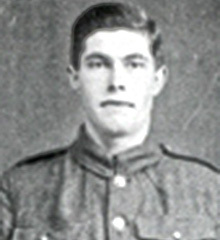 William Workman enlisted in Kilrea. 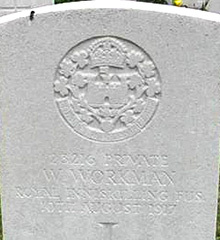 Private William Workman was serving with the 10th Battalion of the Royal Inniskilling Fusiliers when he was killed in action near Passchendaele on Friday 10th August 1917. The cemetery is located to the north-east of the town of Ieper. From the station turn left and follow along M.Fochlaan to the roundabout. Turn right and at the next roundabout turn left into M.Haiglaan. Follow along this road to the traffic lights and at the lights turn right in the direction of Kortrijk (A19). Follow along the expressway to the next set of lights. At these lights turn left into Pilkemseweg, then take the first right into Zwaanhofweg, a small country road. Follow this road to the crossroads and the cemetery is on your right.